Stripe-Rite is a 100% acrylic clear drying emulsion primer for line striping. Stripe-Rite is applied prior to SportMaster Line Paint to fill the minor voids between the masking tape and the court surface to assure crisp, razor sharp lines. 500 to 600 lineal feet of 2-inch line per gallon. 100% acrylic clear drying emulsion primer for line striping. Pavement surface must be cleaned entirely of dust, dirt, and debris. DO NOT DILUTE. STIR THOROUGHLY BEFORE USING. Stripe-Rite can be rolled, brushed, or sprayed. 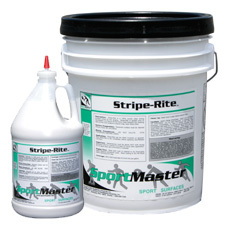 Allow Stripe-Rite to dry completely before applying SportMaster Line Paint. Stir before using. Temperatures must be above 50 °F. both during application and for a period of at least 24 hours after application. Do not apply if rain is imminent or forecast. Keep from freezing. Close container when not in use. Thirty to sixty (30 to 60) minutes under optimum drying conditions. Indoor applications are substantially affected by temperature and available ventilation and will dry more slowly. View in Catalog 1 gal. Jug 10 lbs. View in Catalog 5 gal. Pail 47 lbs.